In 1985, I bought a Macintosh 128K from a friend who couldn’t grasp the potential of this little miracle (let alone a tenuous brush with reality). It came with an ImageWriter I printer, no hard drive, just the internal 400K floppy, and a mouse! The keyboard had no numeric keypad, function keys, or anything, but it was several steps up from my Timex 1000, so what did I care? The coolest thing was the nifty carrying case that the computer, mouse and keyboard (so that’s why the keyboard was so short!) fit into. I could carry it in and set it up in a client’s office in a minute. I think I paid $2,000 for it all, and I was excited as all get out. The coolest thing was that, for the first time ever on a computer (the ones I saw, at least), you could do something graphical and see it happen instantly on the screen. This was in the days of hitting a few keystrokes and then waiting seconds – or even minutes – for something to happen on screen. And here was a computer where you could move the mouse around and interact with things on screen – and it kept up with you! I was impressed. I had no trouble fitting the system, an application, and customer files on a 400K floppy. Good thing, because that’s all it had. Still, that was a lot for a person whose previous computer used a cassette recorder and was ecstatic over a 16K RAM upgrade. Systems were not numbered as clearly as they are now, and the System and the Finder each had their own number series “back in the old days.” Ack! I did brochures and newsletters for my photography clients with MacDraw(!) first – and later with every version of PagerMaker that came along, starting with 1.0! Pretty soon the “Fat Mac” came out, and I had to do something about the memory and the floppy to be to be able to run PageMaker 1.2. I ordered a 512K upgrade kit. But back in 1985, this thing was something. It was an icon looking for a religion to revere it. A nice historical note that everbody knows (don’t they?) is that the original Mac team all signed the case mold. 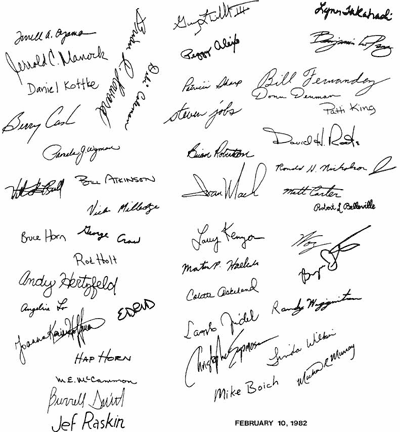 When you “cracked” the case, there were these signatures all over the inside of it. It was like all these John Hancocks signing their name on a manifesto that they were mad as hell and they weren’t going to compute the hard way anymore. I eventually bought an external floppy drive. Then I sold it all and bought a PowerBook 165. But that’s another story.